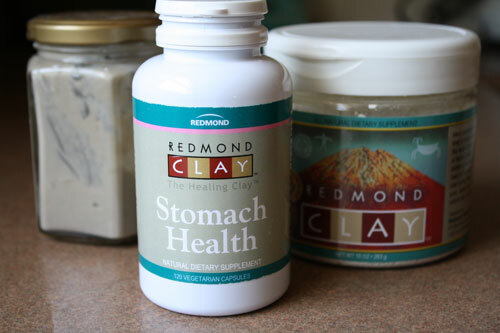 A few weeks into my GAPS diet, a reader left a comment suggesting that I try a product called Redmond Clay. I wasn’t familiar with it, in fact I had never heard of it. I asked around, checked out their website, consulted my naturopath and concluded that these products looked like something worth trying. And that kind reader? She sweet-talked the company into sending me a goodie box of products to try. And so of course, I tried them. Redmond Clay is a bentonite clay. The uses of bentonite clay are many and varied. It has apparently been used for centuries by indigenous people in various medical capacities–as a wound dressing, as a digestive aid, as a salve….the list goes on. It has an interesting property of attracting and binding other molecules to itself, and so is often used as a detox treatment. I’ve incorporated several of these products into my GAPS routine, and so I wanted to share them with you. Here are all of the products that I was sent, and my honest and truly, very own, unsponsored opinions on those products. The Stomach Health capsules came most highly recommended, and yet I wasn’t really sure what to do with them. I spent some time on the phone with my naturopath, who took some time to consider and then recommended that I take one capsule daily, on an empty stomach. Easy enough, right? The trouble is that with GAPS I’m eating so frequently and at random times that I can’t seem to find a regular time to take it. Plus, she seemed a little hesitant in her recommendation and I wanted to know what that was about. I asked a few pointed questions and learned that, for detox purposes, bentonite clay can be used in the same manner as activated charcoal. In GAPS, activated charcoal is recommended for use when die-off symptoms are too severe. Inside your gut, it will basically attract every particle to itself and flush it out of your system. Great, right? Except that it can also bind nutrients, minerals, and other beneficial particles to it. Things that your body actually needs. So, rather than taking these capsules in regular doses, I’ve been taking them when my gut is showing signs of distress–if my detox becomes too intense, or if I try a new food that doesn’t agree with me. And yes, it relieves my symptoms. I’ve never taken activated charcoal, so I can’t compare the two, but the clay capsules have worked really well for my purposes. I really loved the idea of the Earthpaste toothpaste, and was excited to try it. But I couldn’t get into it. I’m not very Western in many ways, but I admit to liking a toothpaste that foams. Since I have it in the cabinet though, I use my regular toothpaste most of the time, and brush with the Earthpaste once or twice a week, trusting in the drawing power of the clay to keep my mouth healthy. The Facial Mud, on the other hand, I adore. I haven’t used it as an all out mask, but I’ve used it as a spot treatment for blemishes as they’re coming on. I put it on at night and leave it on for about 20-30 minutes then wash it off. Every time I’ve used it the blemish is practically gone by morning. This one’s definitely staying in my medicine cabinet. My other favorite product is the Real Salt. This is an all natural salt that is unrefined and unprocessed with no additives. See all that “dirt” in the salt? Those are yummy trace minerals that your body is craving. I’m loving this salt and it will be a staple in my cupboard. The last product in my goodie-box was a tub of powdered clay. All of the products above (well, not the salt) are simply this powder in a hydrated form. So, if you want to try out bentonite clay, but are on a budget, I recommend buying a tub of the powdered clay. You can hydrate a small amount at a time and use it on your face, in your mouth, in your tummy–wherever it’s needed. I got to try out my powdered clay on the Sweet Pea. She came home from a hike with a friend with a bloody knee. I confess to being a little too excited about her injury, because I was so eager to put mud on something. I put a small amount of clay in a jar, added some water, and shook it up until it looked like a good consistency. Her wounds were looking a little inflamed and angry by the time I got to them. The cool mud was soothing, and she didn’t complain about having it on. I put some plastic wrap over it to keep it from drying out and we left it on for about an hour. When I washed it off her knee was still looking pink, but it was decidedly cleaner and less angry-looking. We applied it once more the next night and now her knee is looking like its old self again. Surely, it would have healed without the mud, too. But I think the mud did help with the inflammation and the dirt. I’m so happy that I had the opportunity to try out these products. I think they all have something to add to any holistic health regimen, GAPS or no GAPS. I’m thrilled to have them in my cabinets. The kind folks at Redmond Clay want you to have the opportunity to try out their products, too! They’re sending out three humongous goodie boxes to three lucky readers. Seriously, you won’t want to miss this. The total retail value of this gift box is over $100. And we’re giving away three of them! Visit the Redmond Clay website and leave a comment on this post letting us know which product you are the most interested in trying out. 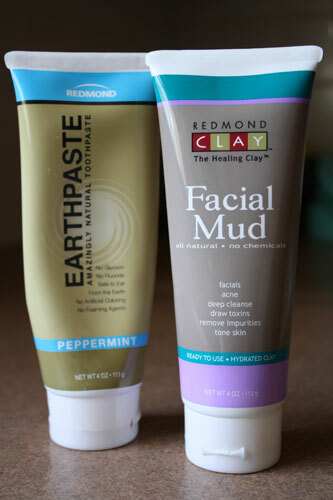 Or, if you already use Redmond Clay, let us know which product is your absolute favorite. PLEASE NOTE: If you choose to do both entries, please leave two separate comments. Otherwise you will only receive one entry. We’ll announce the winner with next Monday’s GAPS post. Good luck! I would like to try the salt. 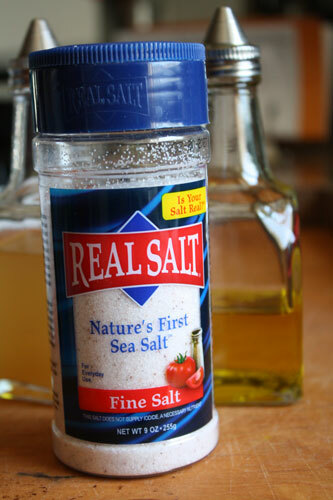 I’ve been using a touch of sea mineral salt in my water and I think it helps a lot since I filter tap water and it removes more minerals with the chlorine…. It all looks good but I’d love to dry that face mask. I mean *try* that face mask. I just shared the link on Facebook. I’d like to try the Earthpaste because I’m sensitive to the SLS usually used as a foaming agents in toothpaste and have to use one without it. This one sounds interesting. I’ve been using the Real Salt for years. I bought some of the saltine year when I was on vacation. I love it! I have cherished the bottle for years now, not knowing where to get another! Thanks to our post I now know!